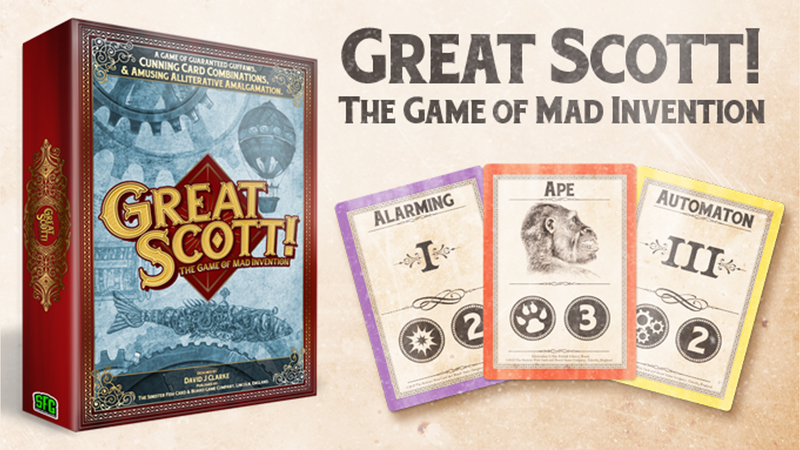 Great Scott is a drafting game of invention from Sinister Fish. While at UKGE this year I had the opportunity to secure a copy of Great Scott. Ostensibly I was there to buy for someone else, but at their recommendation I ended up taking a copy home too. I had never before pondered the need for a Diabolical Donkey Destroying Banana Bender, but I have come to an all new appreciation for the device, and here’s why. Each section is it’s own deck, players take two of each, and commence building by drawing card from a deck, taking one, and passing their hand to the next player. You begin fairly free form, but as the cards are passed around you find yourselves with fewer and fewer gaps to fill, and the pattern you’ve tried to create may suddenly be completed or broken depending on which stack you draw from. Everyone then pitches their idea, describing how it works and what purpose it serves. Everyone picks a favourite and a second favourite, and the next round begins. Points are accrued from scores on the cards, matching pairs or groups, the commendations of others for a fantastic pitch, and alliteration. So while you may score fewer points by building a Colossal Cactus Burning Bee Booster than an Alarming Albatross Attracting Ape Automaton you may still recover some ground by describing the method by which your huge device might hold back the bee extinction by immolating cacti, compared to the guy who’s mechanical gorilla has led to an albatross infestation. I love draft games as a format, it’s been a while since I did a Magic: the Gathering draft, but I still love a round or two of 7 Wonders every couple of months. Drafts tend to leave you completely oblivious to begin with, and madly desperate towards the end, so adding the draw step gives Great Scott a little bit more freedom to build an invention you can be proud of, but doesn’t give you sufficient support to make the game too easy. It’s a sign of a good game that round by round players end up with very similar points, and by the end of Great Scott the point difference between first and last place is quite narrow. There’s a good balance of random and tactical play, and it always leaves you with an invention that is sheer chaos to try and pitch to the crowd. However, it’s this mechanic that does cause a few issues. For those without a very creative mind, trying to describe their inventions can be difficult, especially for those who perhaps don’t know the less common words like Bitumenising, meaning that points accrued in the commendations phase are often lost. The Aspect cards break down into animal, vegetable, and mineral, and it’s entirely true to say that animals are funnier than most rocks and plants like Diabolite or Elm; there are a few shining examples like arsenic and dynamite, but it’s still a bit of a struggle to derive humour from Bauxite for example. Really that’s an issue with target market. I still rate the game very highly, it’s good quality daft fun that kills an hour without effort, and even comes with a set of baggies that are slightly too small for any single deck in the box. Ah well, still a nice consideration.